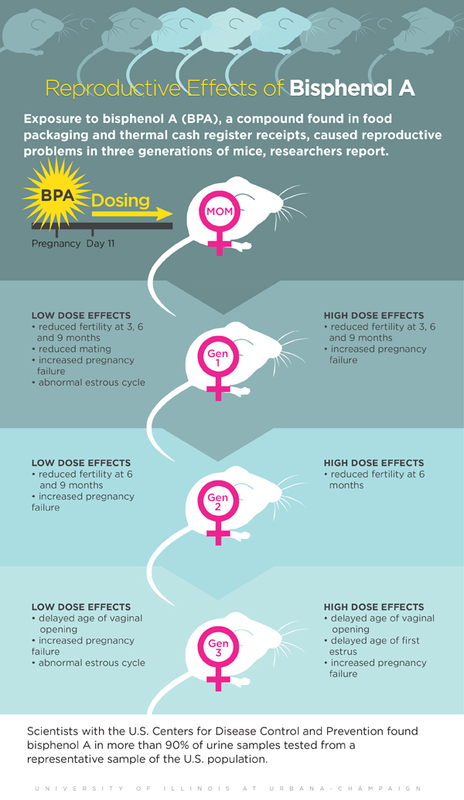 BPA exposure during pregnancy was associated with reproductive problems in the next three generations of mice. When scientists exposed pregnant mice to levels of bisphenol A [BPA] equivalent to those considered safe in humans [below what the FDA says is a safe dose], three generations of female mouse offspring experienced significant reproductive problems, including declines in fertility, sexual maturity and pregnancy success, the scientists report in the journal Toxicology and Applied Pharmacology. A national study found detectable levels of BPA in 93 percent of 2,517 human urine samples tested in 2003-04, suggesting that most of the U.S. populace is regularly exposed to the chemical. … According to the National Institutes of Health, the primary route of human exposure to BPA is diet. Studies in humans suggest BPA also interferes with human fertility and reproductive function, Flaws said. Pesticide residues in food have almost doubled in a decade. Almost 97% of flour used to make bread, pasta, and other baked goods was found to be contaminated with pesticide residues. 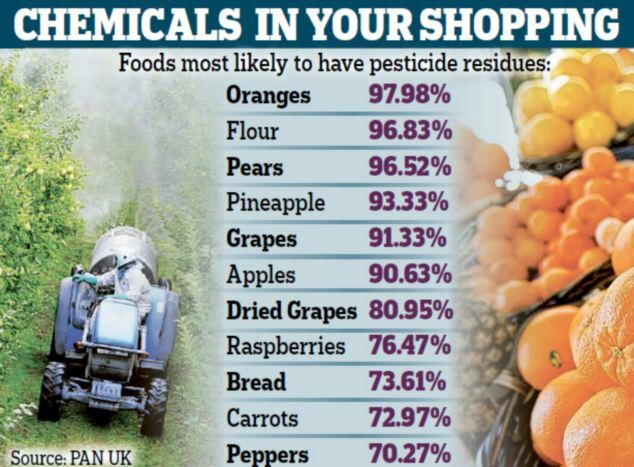 Men who ate fruits and vegetables with higher levels of pesticide residues [e.g. peppers, spinach, strawberries, apples, and pears] had lower sperm count and a lower percentage of normal sperm than those who ate produce with lower residue levels, according to a new study by researchers at Harvard T.H. Chan School of Public Health. Multiple studies have shown that consuming conventionally grown fruits and vegetables results in measurable pesticide levels in urine. The results showed that men who ate greater amounts of fruits and vegetables with higher levels of pesticide residue — more than 1.5 servings per day — had 49% lower sperm count and 32% lower percentage of normal sperm than men who ate the least amounts (less than 0.5 serving per day). The carrots you purchased this morning could contain 25 times the amount of pesticide as carrots you purchased back in April. Sweet potatoes could have 15 times more pesticide. That’s because the EPA quietly issued a new rule, effective on May 1, 2013, which raised the allowed levels of the herbicide glyphosate in a number of common foods. Glyphosate is produced by the Monsanto Corporation. It is the active ingredient in the popular weed killer Roundup. EPA created the new rule in response to a petition it received by Monsanto in May 2012 – Monsanto requested that foods be allowed to be sold with higher levels of glyphosate. If Monsanto can ask EPA to raise limits, can’t The People ask EPA to lower them? Studies in hand? This entry was posted in Uncategorized on April 17, 2015 by Bix.